Samsung’s commercial grade smart signage displays are built for professional use and up to 24/7 continuous operation. With built in system on chip (SoC) media players, SSSP displays offer an all in one solution when paired with embed signage. Features include portrait and landscape orientation support, built in WiFi, Quad-Core processors and 3 year manufacturer warranty. SSSP displays offer a wide variety of sizes for their displays, from 10” to 82” to suit most scenarios and digital signage needs. 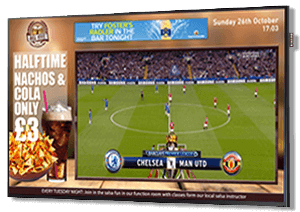 Whether you need a 10” for room booking, 40″s for your digital menu boards or even an 82” to be the centrepiece of your retail store, SSSP displays have you covered. 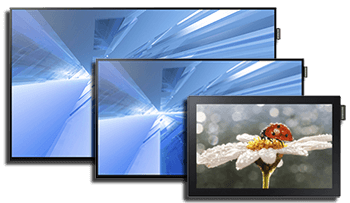 Samsung’s SSP displays are also available in high bright editions suitable for window or out of home displays (in an enclosure). Boasting 2,500 nit ultra-high brightness, 5000:1 contrast in 46, 55 and 75” models you can be assured they will catch the attention of any passerby, at all times of day. SSSP displays offer the ability to display a external source directly directly into a zone using one of the screens input sources such as HDMI. Drive extra sales by displaying offers alongside the news or sport from your satellite box or similar. 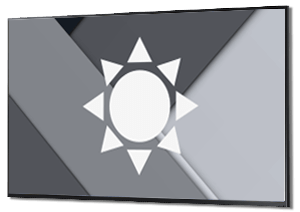 Check out the source input video for a widget walkthrough. Purposely engineered within embed signage are a range of network management tools, designed specifically for SSSP. Using the device controller plugin, receive live snapshots of the display, turn the screen on & off, volumes up & down, reboot, set on/off timer, set device date/time and change input sources remotely. 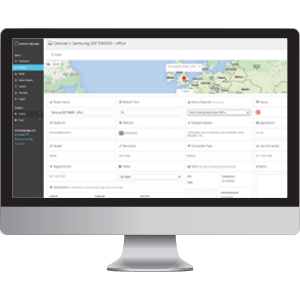 A automatic remote troubleshooting option is also available. From the embed signage devices dashboard you can view SSSP hardware statistics such as CPU usage, device temperature and even remotely update the display firmware. Getting started with embed signage and Samsung Smart Signage Platform is very simple indeed. First sign up for an embed signage account and then configure your SSSP display to run the player application. Once done, register the device to the account and start publishing content to the screen.